I’m over here in Germany for a pre-pro meeting with the agency and clients before my Barcelona shoot. I came in on Saturday to work on beating the jet lag. Today I went all around Hamburg after running the harbor in the AM. The show to see was Visual Leaders 2009 at the Deichtorhallen. It was a juried show of awesome photography from print magazines and advertising. And it was packed!! Such a pleasure to see great work and to see it approached by the public. With so many magazines in the US folding and the constant buzz of video, video, it was nice to see some great reasons that the still photo rocks! Later that night we had wiener schnitzel at Vienna Restaurant. After having so many dried out versions in the US, they do it perfect here. 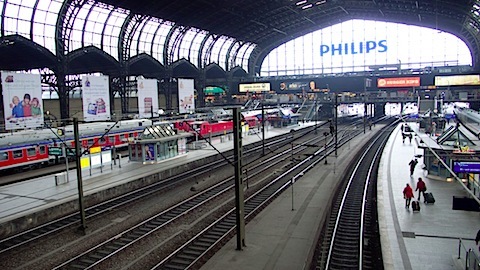 Also, they have one of those cool train stations here. And this pretty wild piece at the KunstHalle. 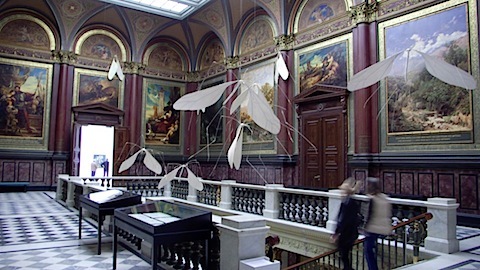 White Moths coming up the stairs by artist Lili Fischer.